From Motif Investing: While 3D printing was once hailed as being part of a new industrial revolution, investing in the 3D printing industry has been a lot like riding a nauseating roller coaster for investors. Over the past five years, stocks for Stratasys and 3D Systems — the two biggest names in the 3D printing sector — have skyrocketed then fell. 3D Systems shot up more than 600 percent in three years, then fell to a four-year low last year, but is back up again now. 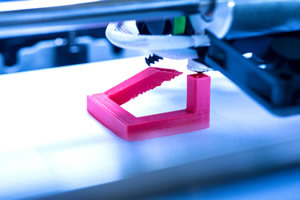 3D printing, otherwise known as additive manufacturing, is the technology that allows a machine to produce a three-dimensional object by layering successive layers of material. A variety of raw materials can be used in the process including plastic, ceramic, glass and precious metals. The technology is now making inroads in a number of industries including confectionery, automotive, aerospace, and defense, education and healthcare. And there is no doubt that the technology will continue to thrive. The worldwide 3D printing industry is projected to grow to from $7.3 billion in 2016 to $12.7 billion in 2018, and $21.2 billion in 2020, according to Wohlers Associates, who are considered experts in the 3D-printing market research. While Stratasys and 3D Systems were the hottest stocks in the 3D printing industry at one point, HP might have been partially responsible for the sudden valuation decrease of these company’s stocks. When the 2D printing giant introduced its Fusion Jet industrial 3D printer in 2015 and formed partnerships with many top-tier partners, including Nike and BMW, HP was seen as a substantial threat to 3D printing marketing share. HP claims its 3D printers, which print in polymers, are 10 times as fast and twice as cost efficient as other 3D printers.